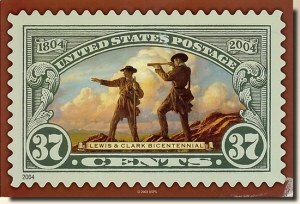 The Lewis and Clark Expedition (1804–1806) was the first United States expedition to the Pacific Coast. Commissioned by President Thomas Jefferson and led by two Virginia-born veterans of Indian wars in the Ohio Valley, Meriwether Lewis and William Clark, the expedition had several goals. Their objects were both scientific and commercial - to study the area's plants, animal life, and geography, and to discover how the region could be exploited economically. According to Jefferson himself, one goal was to find a "direct and practicable water communication across this continent, for the purposes of commerce with Asia" (the Northwest Passage). Jefferson also placed special importance on declaring U.S. sovereignty over the Native American tribes along the Missouri River, and getting an accurate sense of the resources in the recently-completed Louisiana Purchase. They were accompanied by a fifteen-year-old Shoshone Indian woman, Sacagawea, the wife of a French-Canadian fur trader.